Click the image to read the article from John Menadue’s blog – Pearls & Irritations. Mack Williams is a former Australian Ambassador to the Philippines and Republic of Korea. He is a graduate of the Royal College of Defence Studies College in London. Click the image to read the article in the Guardian. 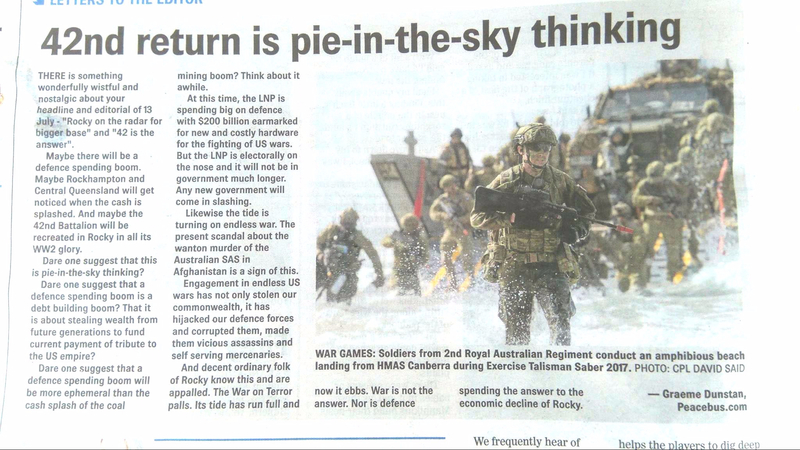 The Rockhampton Morning Bulletin featured Graeme Dunstan letter today after a week reporting on opportunities for defence spending in the region. Talisman Sabre war rehearsals continue. Robin Taubenfeld AKA Granny Smith, at the Independence from the USA Day. AS thousands of troops yesterday prepared for training in the Talisman Sabre military exercise, another group of people held a small peaceful protest. “Instead of spending $50m on Talisman Sabre to train for future US wars of aggression, we need to step away from the wars of the US empire and make our own path, one in which we build a peaceful future with our neighbours and address our greatest collective security threat, climate change,” Graeme Dunstan told those at the Independence from the USA Day gathering. The group gathered outside the Western St Army Barracks, Rockhampton. Anti war-games protester charged with disturbing peace in Australia–Xinhua News Agency, the official press agency of the People’s Republic of China.